Exit One, Interstate 94 marks the beginning (or end, if you’re approaching from the east) of North Dakota. The town of Beach is the sentinel of that exit. It’s a community worth checking out. There are several surprises in its business area, the oldest part of Beach. Exit One. That could mean the first exit in North Dakota. Or, it could mean the last. Either way, two miles from the Montana border lies a cozy little cowboy town, full of exciting western history and cowboy culture, along with friendly folks. And coffee. Great coffee! Beach, North Dakota. Nearly hidden in the center of town is Park Cafe, and along with it Golden Valley Outfitters. This obsolete grain storage facility in Beach, North Dakota stands as a sentinel to the agricultural history of the area. Don’t let it fool you. There’s more to Beach than this! After exiting Interstate 94 and following the main road south, into town, the site of an old landmark grain storage facility might be deceiving. Venture past the railroad tracks and investigate the rest of the quaint cowboy town. In addition to some fine residential structures and the beautiful Golden Valley County Courthouse, you’ll take note that there are still some thriving businesses in Beach. Business is brisk in this thriving small town. Beach, North Dakota. Several are of particular interest. The sign for Golden Valley Outfitters caught our eye! This historic building houses one of the best coffee/sandwich shops in the area and a very well stocked western wear store. It’s a true hidden gem! The bright, welcoming Espresso flag got our attention, as did the blackboard sign on the sidewalk. Clothing. Espresso. Park Cafe. What was this place? We couldn’t resist. Not only were we curious, but we also craved a GOOD cup of coffee! The Park Cafe in Beach, North Dakota offers a limited menu, with daily specials, and mighty fine coffee and espresso. We’d no idea what to expect, but the items in the window definitely piqued our interest. What kind of ‘outfitter’ could this be?? This window gives just a peek of what you’ll find when you walk through the front door of Golden Valley Outfitters in Beach, North Dakota. The merchandise is impressive! Wow! Western Wear! Lots of it! I had a definite ‘Wow!’ reaction when I entered this business establishment. I was not expecting what I found, and that was an extensive inventory of good quality western wear! Boots. Hats. Shirts. Jeans. Accessories. And lots of ’em! The selection of western wear at Golden Valley Outfitters in Beach, North Dakota is impressive! It’s nearly a hidden gem! Golden Valley Outfitters in Beach, North Dakota carries an extensive line of western wear for men and women. We went for coffee, and found so much more! I found the interior of this historic mercantile very inviting, and reminiscent of my childhood in small town North Dakota (a few years back!) when life was simple and shopping was done locally. The smell of the wood floors, the look of the tin ceiling, and the welcome of tables and chairs in which to rest made this place feel homey, genuine. My mind easily imagined historic Beach, a major cowtown in western North Dakota, crucial to cattle drives and later transcontinental rail transportation. Golden Valley Outfitter is directly across the street from the railroad tracks. It must have been a popular establishment of some sort back in its hey-day. This isn’t just a western outfitter hidden in small town western North Dakota, it’s an eatery and coffee shop, too. Spend some time here. A refurbished building, historic, across from the railroad tracks in Beach, North Dakota, is brought back to life with excellent coffee, espresso, and eats, along with a great selection of western merchandise at Golden Valley Outfitters. And Then, There’s The Coffee! Espresso. The other window signage indicated there was more than coffee here. Espresso! At the rear of the nostalgic store, we found it! Upon entering the front door of this vintage Beach, North Dakota building, not only does one find themselves drawn back in time, they discover beautiful merchandise and good coffee and food items. The coffee. Was it good? Yes! You’ll find more than just convenience store coffee here. You’ll find a barista! Employees here are trained to make coffee drinks correctly. And variety! There is a lot of local interest, and faithful patronage, judging from the names of some of the specialty drinks! The coffee at Park Cafe in Beach, North Dakota is more than good. It’s great! That’s in part due to the equipment and trained people operating it. It’s obvious from a study of the extensive menu that locals frequent this coffee shop/eatery, and they have their specially formulated favorites! The Park Cafe is a major part of this mercantile, and it’s menu, while not as extensive as a full-service diner, had more than enough choices for our tastes. From the looks of it, locals get involved in the offerings, and a bit of their creativity surely makes for good sandwich combinations. That ‘Triple V’, named after a well-known (and historic) ranch on the Little Missouri River south of Beach looks good to me! And who would not be enticed by the “Stud Guy’! We’re going back to check that out! These sandwiches are like none other you’ve ordered elsewhere. Special items are the result of steadfast customers who know their sandwiches well! We were more than pleasantly surprised by both Golden Valley Outfitters and Park Cafe. We’ve been down this Beach, North Dakota street many times on our way to visit Tama Smith, potter extraordinaire of Prairie Fire Pottery, but somehow we’d missed this business. Summer and fall at Prairie Fire Pottery always add color to the business district of Beach, North Dakota. A stop at Prairie Fire Pottery will make you feel good! You’re always welcome there. Golden Valley Outfitters & Park Cafe. Hidden Gems! Hidden Gems? Yup. Golden Valley Outfitters and Park Cafe in Beach, North Dakota are just that! We hope they won’t be ‘hidden’ much longer. We recommend stopping in at Golden Valley Outfitters and Park Cafe on your next swing through western North Dakota. The shopping is surprisingly good, and the coffee and food are mighty fine. The friendly people in Beach, especially at Golden Valley Outfitters and Park Cafe, will make you feel welcome! Here’s an added bonus for you. It’s a 10-point resource guide with links to show what is happening around the area. Download the resource guide and you’ll be able to access some of the best calendars to tell you what’s happening in the region. These could be the Most Beautiful Views of western North Dakota! This once major highway is not on the map, but you should drive it! This secluded ranch helped reform one very cool president! 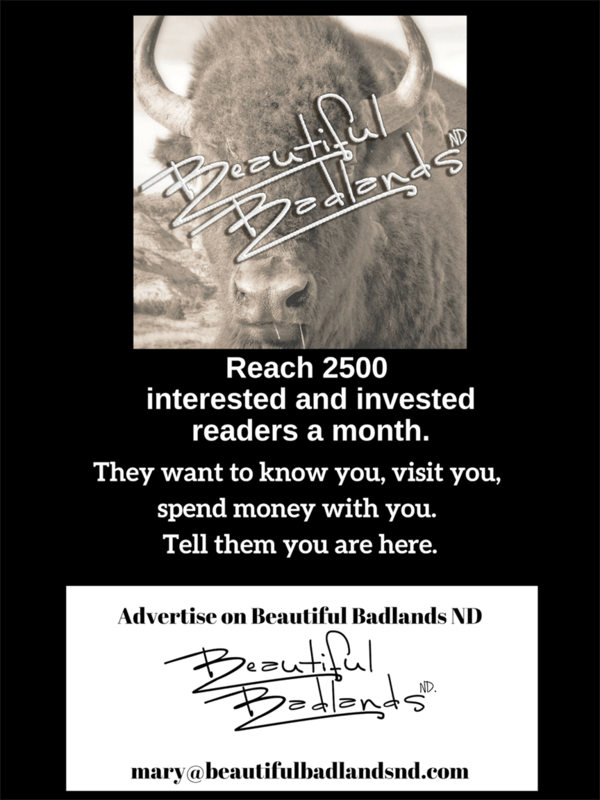 Join our Beautiful Badlands ND Facebook community. We’d love to hear from you, and let you know What’s Happening in western North Dakota and eastern Montana. Ranch Life, north of Beach, North Dakota. Purchase here. Living Was Good. South of Sentinel Butte, North Dakota. Purchase here. Road to No Rainbow. South of Sentinel Butte, North Dakota. Purchase here. Road to Square Butte. Purchase here.